Heat oil in a wok or large frying pan over medium-high heat. Add mince and cook until evenly browned. Pour in the SAN CHOY BOW SAUCE and mix through the pork mince. Simmer for a couple of minutes to let the mince absorb that tasty sauce. Open up those crunchy WATER CHESTNUTS, drain away the liquid and pop them into the pan along with your softened vermicelli noodles. Toss to combine, then add the corn flour mixture. Cook for another minute to allow the sauce the thicken. There shouldn’t be too much moisture. Remove from the heat and mix through the spring onions. Make a flour ‘glue’ by mixing the plain flour with 1 tablespoon of water. This should be a thick paste. Place a spring roll wrapper on a clean bench top with one corner closest to you. Place about 3 tablespoons of mixture on the bottom half of the wrapper. Fold the bottom corner of the wrapper over the filling to form a sausage shape. Then fold in sides and roll up from bottom to top. Just before reaching the top corner, use your finger to brush the corner with flour ‘glue’ and continue rolling to seal. Repeat until wrappers and filling are finished. Fill a saucepan or wok to about 1/3 capacity with the vegetable oil. Heat over high heat. Once the oil is hot (325°F or 165°C or when a wooden spoon dipped into the oil forms small little bubbles) cook spring rolls until golden. Flip them a couple of times as they cook to ensure an even colour. Drain on kitchen paper. Place sweet chilli sauce in a small bowl and sprinkle with the CRUSHED PEANUTS. 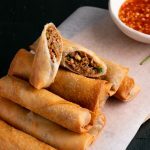 Serve with the spring rolls.